There are several ways you can obtain this product. We sell 4-Mil and 6-Mil Glass Shield in 36”, 48”, 60”, and 72” widths and in 25′ increments. 6-Mil Poly is 60” only and in 25’ increments. Multi–Layer is only available in precut pieces. We come out (added charge) or you can take all precise measurements of the areas you would like to have the material installed. Including all cut outs, angles etc. We convert all the measurements into a vectorized image on a CAD style computer program. We can also include an engraved part number in a lower or upper corner that is inconspicuous for easy reorder and placement. We digitally cut your patterns on state of the art CNC machines with .001 tolerance. If your material is damaged in the future, all you need to do is contact us to order the pieces referencing the engraved part number. We run production on the new film and ship to you direct. 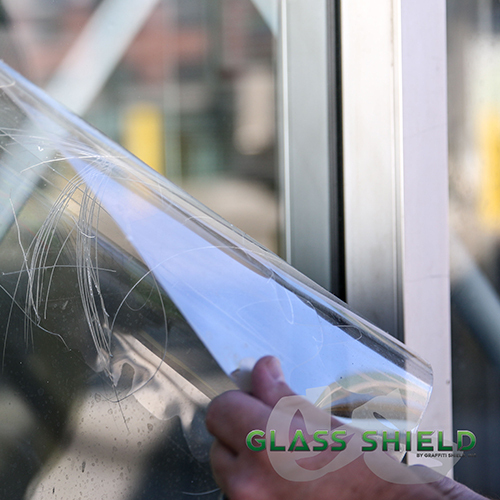 Glass Shield is a 4 and 6 mil thick graffiti abatement film designed as a clear, undetectable sacrificial coating on glass or other surfaces. Glass Shield is utilized across a multitude of industries and installed on a wide variety of surfaces to help combat graffiti vandalism. Graffiti Shield products are sold by the roll or in pre-cut pieces.